Compartment syndrome is a serious and painful condition that involves increased pressure in a muscle compartment. The pressure escalates to dangerous levels and compresses muscles, nerves and blood vessels. This can cause tissue death is not detected or acted upon in time. Acute compartment syndrome is a medical emergency that develops over hours. Compartment syndrome can develop in an arm, leg, abdomen, hand or foot. It can result from a crush injury, tight casts, burns, bleeding, trauma, fractures, or swelling from a soft tissue injury. It can even result from prolonged surgery that puts pressure on the body. The syndrome develops because the fascia that surrounds the compartment does not stretch when swelling occurs. The swelling causes increased pressure on the structures in the area and thus blocks blood flow. 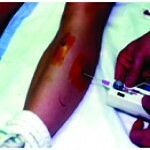 Nurses are expected to know the symptoms of compartment syndrome and identify patients at risk for its development. The assessment of pulses, sensation, and movement of a limb will detect early signs of compartment syndrome. This is a dreaded complication that can cause massive damage to a limb. Compartment syndrome cases are complex and expensive to handle legally, which is why most law firms either do not handle them or do not have the skills and resources to handle them properly. Our compartment syndrome medical experts can help screen case for merit and save time and money for you. Med League provides Medical expert witnesses with expertise in evaluating orthopedic malpractice cases. Call us for assistance.